INNOVATION - The new Genesis is a unique all encompassing compressed air station replacing the many individual components that comprise a traditional system, saving you valuable space. The new Genesis includes everything you need to provide a reliable source of high quality, dry, clean compressed air to your system in one convenient unit. LOWER NOISE LEVELS - With operating noise levels between 57db(A) and 69 dB(A) the Genesis compressor can be located directly into the working environment and nearer the point of use, creating a more comfortable workplace and reducing installation costs. 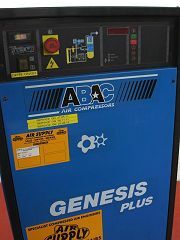 REDUCED MAINTENANCE - Special attention has been directed toward the ease of service in the design of the new Genesis compressor. Extended service intervals, quick and simple access to all components and the use of convenient 'spin on' oil filter and air/oil separator allow for a minimum disruption and a reduction in maintenance costs. AESTHETIC DESIGN - The Genesis is a hardworking industrial machine designed for heavy use, even so the design of the new Genesis means that it looks good. The proportional, clean and modern design of the new Genesis is attractive in any environment. 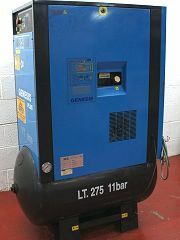 INSTALLATION - A traditional compressed air system comprising eight individual components can be replaced entirely with a single Genesis compressed air station. The unique Genesis concept is not only convenient but is also much simpler to install, easier to move and requires far less space when compared to a traditional system. A simple connection to a suitable power supply and to the compressed air network is all that is required to effect an immediate installation. AIR QUALITY - The new Genesis compressor has been deigned from the outset to provide clean compressed air in line with key environmental objectives. This means the Genesis runs cooler and cleaner than other compressors. In addition the Genesis is fitted with an efficient air treatment package comprising refrigerant dryer with R134a gas, pre filtration, hyper filtration and modular condensate drain. The compressed air provided by the Genesis is exceptionally clean and dry, suitable for hundreds of sophisticated applications throughout industry.